Recently I wrote about dragging out the Christmas fruitcake and how good it was even after several months. People began to ask for the recipe. So I decided to write it out with all the cooking info and then I failed to save the document. Then every day I thought I would replicate it and every day I failed to post because I was so sure I was going to post the fruitcake recipe. Now it is April 15 -- and yes, as it has so often this year, it is SNOWING here in West Virginia. I am not in the garden, so I finally got the info together. You will find a very long set of cooking cliff notes. Since fruitcake can be daunting and time consuming, we wanted to give you a narrative of exactly what you would be going through. It is not something one just jumps up from the couch and says, "Let's make some fruitcake." After the tedious notes, you will be prepared for the pared down recipe, which should be easy to follow. First is “garbage in; garbage out.” Use really good fruit. We buy a lot of our candied peel from King Arthur. They also have a “fruitcake mix” but it includes dates and we don’t do dates. We do not do nuts, which is why this is a FRUITcake. We like a mix of raisins. Regular raisin, sultanas, currants, some companies have “mixed raisins” which work nicely. Now, you must look at baking a fruitcake the same way you look at barbecue: “Low and Slow.” If your oven is set above 300 degrees for a fruitcake, you are cooking it way too hot and it will be dry. This fruitcake cooks at 250 degrees for 3 ½ hours. We have a soft spot for quatre épices. There are many slightly different blends but it is basically a mix of ground white pepper, nutmeg, ginger and cloves. Some recipes use cinnamon in place of ginger. We keep of large jar of cinq épices. Equal measures of ground spice including white pepper, nutmeg, ginger, cinnamon, and a half-measure of cloves, as they can be overwhelming. So 2 tablespoon each of ground white pepper, ground nutmeg, ground ginger, ground cinnamon and 1 tablespoon of ground cloves. Whenever we see a tedious recipe that calls for a teaspoon of cinnamon and a teaspoon of nutmeg or ¼ teaspoon of ginger and ½ cinnamon and 1/8 teaspoon of allspice we just add it up and add in our spice mix. DO THIS it is a great idea. You want to soak your fruit in a nice alcohol. Soak it in something you drink – we are partial to Jack Daniel’s, but rum works. The late, great Edna Lewis used a little red wine. Soak the fruit overnight on the counter. If something comes up and you can’t proceed, put the fruit in the refrigerator and let it set for two days or a week, don’t sweat it. You need to spend time lining your pan. 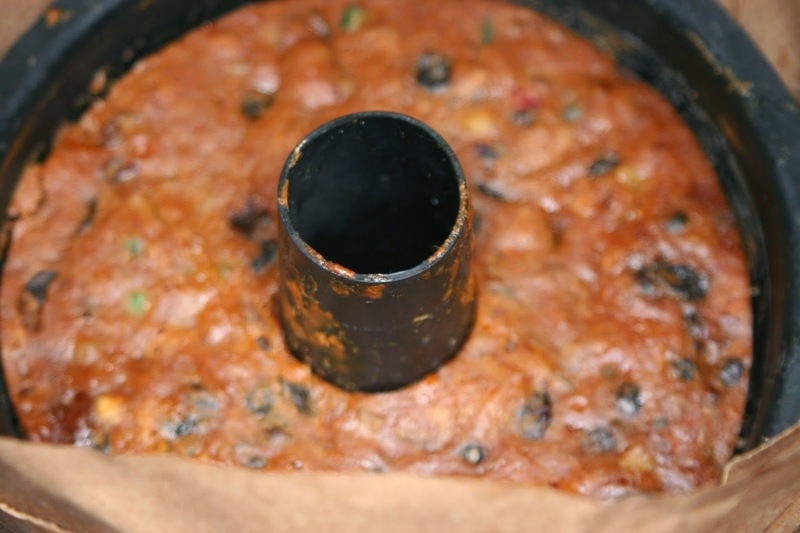 For the sake of simplicity, we are proceeding with the idea that you are baking the fruitcake in an 11 X 4 tube pan. (We almost never bake it in this type of pan. We usually make smaller sizes to give away. A smaller pan means less oven time, so make adjustments. You will end up with about 12 cups of fruitcake batter. Four loaf pans will cook in about 2 hours and 15 minutes) Since the cooking time runs over 2 hours, the cake needs to be protected. 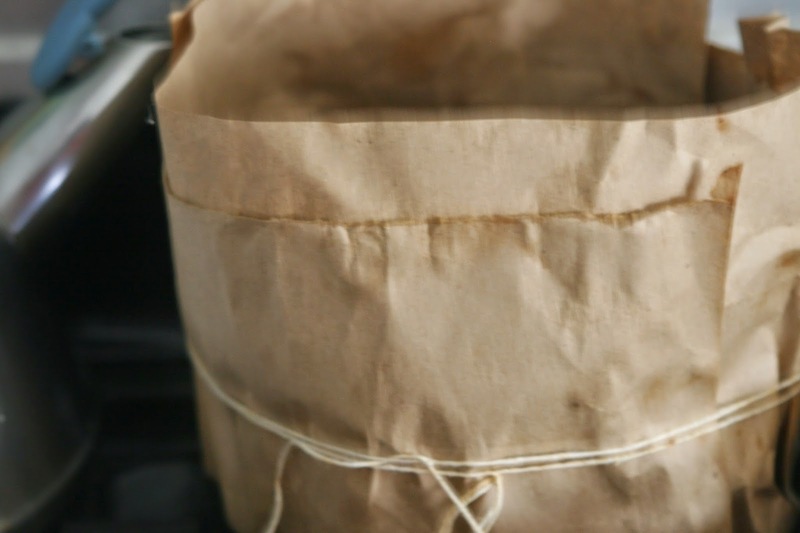 We line all our pans with brown paper, though parchment will work, too. A light coating of butter or PAM will help hold the paper in place and let the cake release from the paper. After the first 90 minutes of baking, you will want to open the oven and use an extra piece of brown paper to lie across the top of the pan to further protect the cake. If you are using a thin-walled pan, like an aluminum angle food cake pan, you will want to add an additional layer of paper to the outside of the pan. (See below.) Personally, we think lining the pans is the hardest part of fruitcakes. Now it is basically cake making. Add the dry ingredients to a large bowl and give it a quick whisk to incorporate the spice, salt, baking powder and flour. Cream the butter and brown sugar; add the egg yolks, a little at a time, and finally the syrup. Start incorporating the flour mixture a little at a time. When all the flour is added you are going to end up with more of a cookie dough texture than a traditional batter. At this point, you will need to proceed by hand, as the mixture is too thick and too bulky to remain in the mixer. You will also need to whip the egg whites, so unless you have two bowls, you will need the mixer. Add the macerated fruits with their liquid to the batter and mix well. Finally, fold in the egg whites. The cookie-like dough will now be a thick batter. Add carefully to your lined pan and bake. Once the cake is done, remove it from the oven and let it cool in the pan. When it is cool, you will want to carefully remove the paper. Now you will need to “doctor” the cake. You will need your alcohol of choice, cheesecloth, cling film, and aluminum foil. In a small bowl, add about ½ cup of alcohol and the cheesecloth. Soak the cheesecloth, then wrap the cooled cake in the soaked cloth. Wrap the cake and cheesecloth in the cling film; finally wrap the cake tightly in foil. Every couple of weeks, you will want to unwrap the cake and re-soak the cheesecloth. Some people swear it last for years! 2. In a large bowl, mix the peel, raisins, and sultanas with the bourbon and let macerate for at least 8 hours or overnight. 4. Into a large bowl, sift the flour, baking powder, salt, and spices. 5. In a stand mixer, cream the butter with the brown sugar until light and fluffy. Separate the eggs, reserving the egg whites. Lightly beat the 5 yolks and add to the mixture, beat until incorporated. Add the sorghum and beat until incorporated. Add the flour, a little at a time, beating well after each addition. (At this point, the mixture will be more cookie dough than cake batter. You will probably have to remove the mixing bowl and continue on by hand.) Stir in the fruit mixture with the all the macerating alcohol and combine well. 7. Bake the fruitcake on the middle of the oven for about 1 1/2 hours. Remove and cover it with a piece of brown paper or parchment but NO aluminum foil. Continue baking for about 2 hours. Now you are ready for next Christmas. Send pictures! Excellent! I'll have to try this. 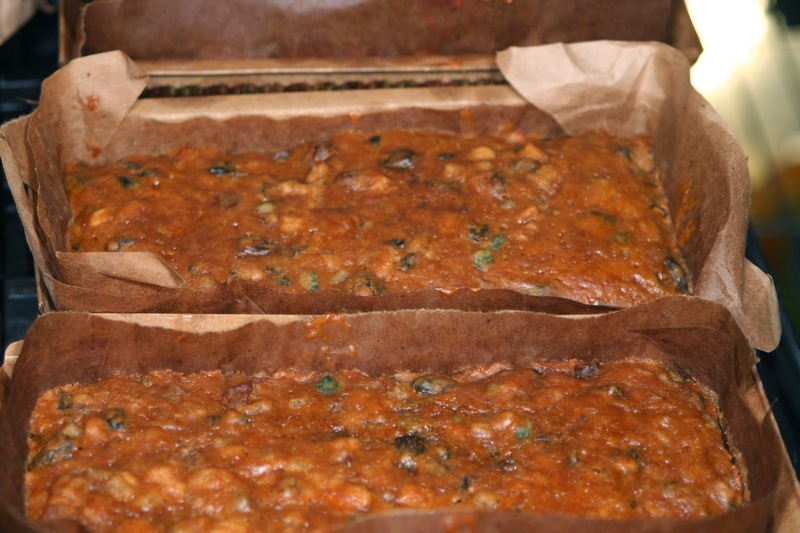 A few years ago, I made Jeffrey Steingarten's fruitcake, as well as Laurie Colwin's "Country Christmas Cake" (and blogged about it here http://patience-crabstick.blogspot.com/2010/01/dont-fear-fruitcake.html) It was quite an endeavor! Now, four years later, I might be ready to attempt another fruitcake.